Augmented reality is all the rage in live sports production, with networks like ESPN and Fox Sports trading in some physical sets for virtual studios and live AR graphics — most notably, during CBS Sports’ Super Bowl LIII open — taking the place of traditionally preproduced elements. And while AR is a fun addition to the producer toolbox, broadcasters must find ways to elevate AR from mere eye candy to something that informs the viewer and helps tell the story. 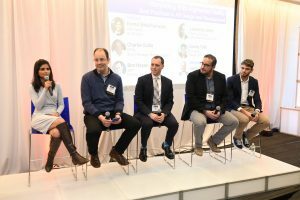 At SVG’s Sports Graphics Forum early this month, a panel of creative directors discussed best practices in AR design and development. Charlie Collin, senior manager, motion graphics, ESPN, described his work with ESPN staple Around the Horn, and how his team went to great lengths to ensure that the show would not be overpowered by virtual graphics. With limited space in ESPN’s new South Street Seaport studios in New York City, Collin’s team initially considered creating a green-screen environment for host Tony Reali. However, such an environment would detract from the main purpose of the show: Reali’s interaction with his panel of journalists. Balancing the real world and virtual world is pivotal to leveraging augmented reality in an organic way. For years, iconic AR tools, such as SMT’s 1st & Ten line in football, have been deployed to enhance viewer’s understanding and enjoyment of the game without interfering with the production. Another point to consider, said Fox Sports Design Director Danny Tello, is how to make compelling AR and virtual graphics after the novelty has run out for the viewer. Fox Sports has sought new ways to engage viewers of its NASCAR Race Hub through virtual elements like an in-studio track and racecar. CBS Sports accomplished one of the most eye-catching uses of AR with its Super Bowl LIII open. The creative and technical feat was made possible in part by The Future Group, and Lawrence Jones, EVP, Americas/ECD, The Future Group, described how leveraging the real-world environment — Mercedes-Benz Stadium — made the virtual graphics even more impressive. Besides telling the story, broadcasters are finding ways to use AR and virtual graphics to inform the viewer. CBS Sports Art Director Komal Bhukhanwala, an integral player in getting the Super Bowl LIII open to air, explained how data integration into AR and virtual graphics is the next step.